This is the second of a two-part post on the startup and scaleup scene in Athens. Read the introduction here. “One question is a gift to the world that can travel widely,” says Yiorgos Nikoletakis, founder of 100mentors. The startup provides school children around the world with the opportunity to ask questions of just over 4000 of the brightest academics: scientists and experts in academia; professors at Harvard or Cambridge universities; top scientists at Nasa. Nikoletakis was a Fulbright scholar who stayed in the U.S for seven and half years, returning to Greece to do his compulsory military service before setting up 100mentors in 2015. 100mentors started life in The Cube Athens, the central Athens coworking space (see here), first as a team of two then departing for a bigger space as it reached six in number. The students pose their questions in 20-second videos, in Snapchat style, and the experts have 100 seconds to give a reply. An example might be Artemis, a 12th grader at the American Community School, exploring the theme of “Analysing Theatrical Pieces”. She asks the question “if language shapes thoughts?” of Michael Dobson, none other than the Director of the Shakespeare Institue. Listen to the exchange in the video above. Of the 32 countries involved 420 schools, such as the American International School in Vienna and Nord Anglia International School in Hong Kong, pay for their students to ask questions. A freemium model, for some schools in the U.S. and remote islands in Greece, allows the students to listen to the experts’ answers but they cannot ask the questions. It’s quite staggering the level of expertise on offer to students. But universities and institutions are more than keen to get their experts on the platform. 100mentors is the softest of marketing to a difficult-to-reach generation of future students. Number of employees: 13 (2 U.S., 1 German, 1 Austrian, 1 Canadian, 1 Turkish, 7 Greeks and 4,234 mentors from 44 nationalities covering more than 20 languages). Size of office 120 sq.m. Investors: The Openfund (investors in Taxibeat, Workable), Dr Alex Eleftheriadis (Columbia professor), Apostolos Apostolakis (founder of V.C. VentureFriends), Argyris Zymnis (sold his company to Twitter). Favourite coffee shop in Agia Paraskevi: Φ bakery – for deliveries! We go and sit, however, in Nomad, Chalandri, with its perfect coffee. Both Alexis Pantazis and Emilios Markou, cofounders of Hellas Direct, are from Cyprus but met while working for Goldman Sachs in the UK in 2008. Markou worked in insurance, Pantazis in asset management, but both felt banking was about to go through a tough time. They wanted, instead, to start something in insurance from scratch, focusing on cars and property, but not in the U.S. or U.K because of the competition. They picked Greece. Their value proposition was to own the technology, so as to control it, undercut some of the 42 insurance companies operating in Greece, resonate with customers and be trustworthy. How could they disrupt the traditional insurance model? For example, why a yearly contract? What about daily or monthly? What else could they sell such as car financing? And finally how to craft making a claim so that it is not a pain.? “We thought at first we would approach five Greek shipping magnates for investment but they only know about ships and London property,” says Markou. 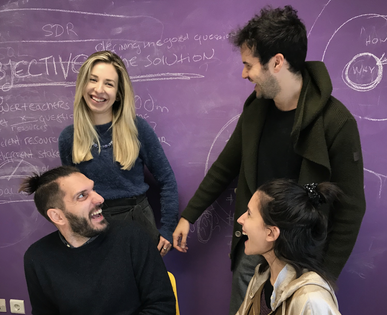 Two and half thousand targeted contacts, 300 meetings in 14 countries later, Hellas Direct raised €8.5 million and launched in 2010 with a second round in 2015 and a third in 2018, bringing the total to €24 million. “For most, it was a contrarian play to invest here,” says Pantazis of the investors which include US hedge fund Third Point and the David/Leventis family, the only Greek investors but one of the wealthiest in Greece. It owns, among several enterprises, Coca-Cola bottling plants in 28 countries. The World Bank has now come on board, seeing Hellas Direct as a black box that can be plugged into emerging economies in the Balkans. So expansion “eastwards and southwards,” says Markou. Hellas Direct now has 83 employees with software developers in Cyprus and a claims support team/call centre in Athens. In Cyprus, the company is looking to attract highly educated Cypriots currently working overseas but keen to return home, notably circulating advertisements playing on Brexit for those Cypriots working in the U.K. In Athens, ”we want those with the smart attitude of ‘I want to fix Greece,” says Markou. Potential employees join after three rounds of interviews followed by training for successful applicants because “the education in Greek universities is not particularly practical” – a comment I heard more than once in the city. Do the pair miss London? “We are making market research easy and cheap for everyone,” says Andreas Vourkos, cofounder and COO of Pollfish. It’s a company that allows clients – global brands or marketing agencies – to ask questions of a wide range of demographics using mobile. It can be done so quickly that a team can test a new product design or packaging during a meeting with a client. Vourkos was at the University of Patras, with his future cofounders John Papdakis and Zissis Bellas, all three struggling to find ways to make money through apps they had created. They wondered, would people be prepared to answer simple survey questions on their mobiles? The users of their apps provided plenty of potential survey respondents and a client willing to ask questions was on hand. A test survey was run. The cofounder, to this day, is still visibly excited as he describes the moment the data came in showing that they were correct in their assumption. “We looked at how to grow a product about market research,” says Vourkos. “Ironically we did not know much about the subject. But it was that lack of knowledge which allowed us to take a fresh look at surveys through mobile – rather than online or offline”. The platform allows clients – global brands or marketing agencies, to easily set up surveys, defining parameters such as age, education and location. It even allows the client to request a time for completion of the survey in as little as an hour. Each response is charged at anything between $1 and $2. For the respondents, users of over 150,000 apps – gaming, ringtones and quizzes are a few – are incentivised to answer questions by new functionality being unlocked on an app or earning currency to use in a game. And for the publishers of the apps, they earn 30% of the clients’ fees and Pollfish takes the remaining 70%. Pollfish opened up in Monastiraki, central Athens, in 2013, moving to Ampelokipous, just north of the centre, last year. It is now headquartered in New York, close to the most important clients with Papadakis, as CEO and one of the three cofounders, relocating there as well. As the first mover in mobile surveys, Pollfish has 99% of the mobile survey market and is constantly iterating the platform to keep it there. It’s certainly been beating the traditional pollsters and, some might say, more accurate. “We even predicted the results of the Greek referendum, Brexit and the election of Trump,” says Vourkos. Clients include: Microsoft, BBDO, Millward Brown, Calvin Klein; top four ad agency holding companies (WPP, IPG, Omnicom and Publicis Group); Bustle Digital Group. Athens vs Patras – Athens for the win! This is the second of a two-part snapshot of Athens’ startup and scaleup scene. Read the introduction to Athens’ New Realism here.